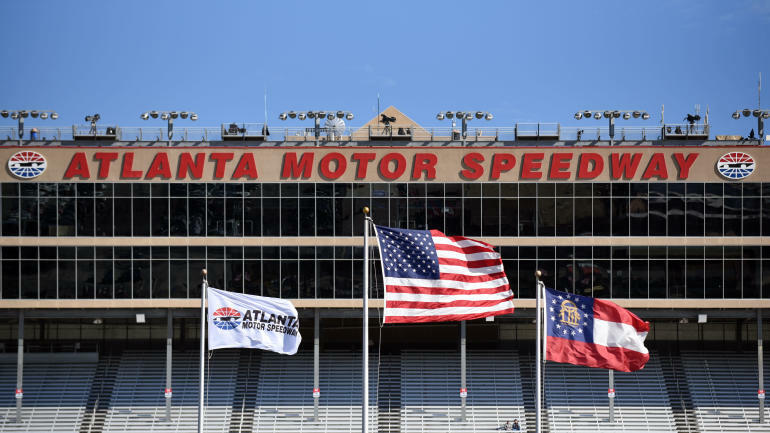 One week after Denny Hamlin won his second career Daytona 500 NASCAR is back in action at the Atlanta Motor Speedway for the 2019 Folds of Honor QuikTrip 500. Despite winning The Great American Race with 10-to-10 1 odds, Hamlin entered the race at 15-to-1, while last year's winner, Kevin Harvick, is the favorite at 4-to-1. , claiming his first green-and-white checkered flag of the season. The two battled it out again in Stage 2, but this time it was Harvick who earned a playoff point. Aric Almirola started the race from the pole and had no problem pacing the field early while the rest of the pack maneuvered its way through. Kyle Busch started the race from behind in backup car but had no problems moving into contention as the leaders held firm. Almirola led 35 of the first 36 laps before NASCAR waved a scheduled competition caution to allow crews to make adjustments due to rain on the track the night before. The No. 10 however was slow on exit from pit road, allowing Larson to restart from the lead. Larson had no problem doing what Almirola did on the first go around, leading in clean air. Despite starting in the middle of the pack, Kevin Harvick mounted his charge toward the lead in the final 15 laps of the stage. Stage 2: Larson and Harvick battle it out while Almirola was penalized for speeding and had to restart from the rear. Joey Logano and Alex Bowman got tangled up to their stalls and lost considerable track position as well. The No. 4 keep serving despite a four-wide challenge on the restart. Martin Truex Jr. and Larson then started battling for second, with Larson eventually claiming the position. Harvick led 22 laps before getting loose and surrendering the lead back to Larson, who was gaining seconds each lap. Larson pit from the lead for a scheduled stop 41 laps into the stage, with Harvick and the field following shortly after. The No. 42 quickly recycled to the lead, gaining about 1.5 seconds on Harvick who moved back to second. Kyle Busch missed the entrance to pit road and lost position during green flag stops. Brad Keselowski also lost time to his team's jack breaking during his stop. With 17 to go, the battle for the lead started ramping up between Harvick and Larson. The No. 42 red its famed high line while the no. 4 stuck to the bottom. In this run, it was Harvick who came out on top as Larson's tires began to show a little wear. The race is streaming on fuboTV, and you can follow along with our CBS Sports live blog for updates, highlights and analysis from the event.